He founded the Royal Institution’s Friday Evening Discourses and in the same year the Christmas Lectures, both of which continue to this day. He himself gave many lectures, establishing his reputation as the outstanding scientific lecturer of his time. He was inspired by the discovery that electric current through a wire produced a magnetic field around the wire and started to investigate the relation between elecricity and magnetism. Months after he started, he was the first to produce an electric current from a magnetic field. Later, he found that when a permanent magnet is moved in and out of a coil of wire, a current is induced in the coil. He also discovered the law determining the production of electric currents by magnets. I assume that by now it’s obvious that “he” is Michael Faraday. “Although Faraday received little formal education, he was one of the most influential scientists in history. It was by his research on the magnetic field around a conductor carrying a direct current that Faraday established the basis for the concept of the electromagnetic field in physics. Faraday also established that magnetism could affect rays of light and that there was an underlying relationship between the two phenomena. He similarly discovered the principle of electromagnetic induction, diamagnetism, and the laws of electrolysis. His invention of electromagnetic rotary devices formed the foundation of electric motor technology, and it was largely due to his efforts that electricity became practical for use in technology. Faraday, however, was not only a great experimentalist. 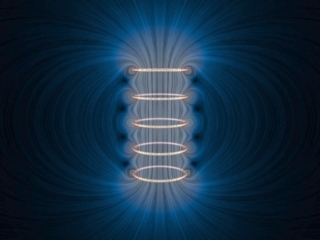 Image from A Visual Tour of Classical Electromagnetism. This entry was posted in physics and tagged birthday, chemistry, famous scientists, Faraday, field, History of physics, history of science, Michael Faraday. Bookmark the permalink.